Thanks to advances in technology, it's becoming more and more common for employees to work outside the office. With chat platforms like Slack, video calls, and collaborative web apps, workers are able to take their work beyond the cubicle—improving their job satisfaction, their work-life compatibility, and even their productivity. 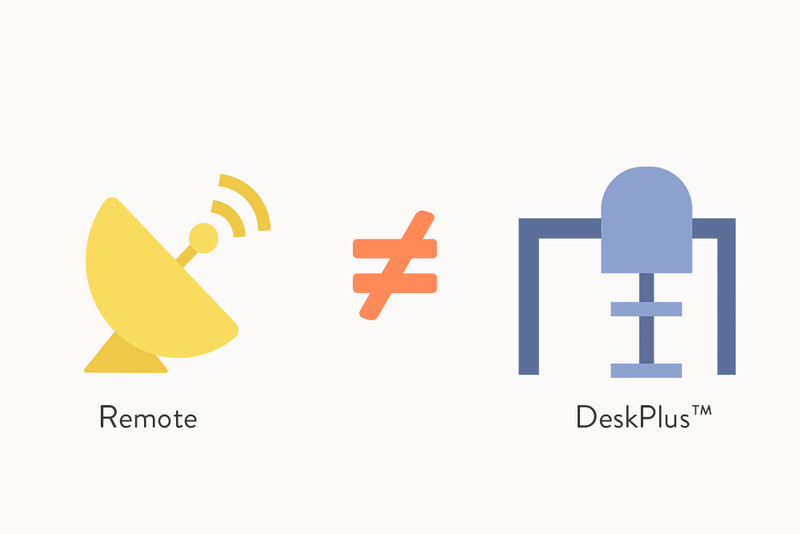 That's why Remote and DeskPlus™ are two of the most-desired types of workplace flexibility in our Flexiverse™. But we know what you're asking: If both Remote and DeskPlus respond to location-based employee needs, and if they both get you out of the office, then what's the difference between the two? It's all about how much time, if any, you spend in the office. With Remote, you never work at a company office. While many Remote arrangements are fully location independent—meaning you can work from home, a shared work space, of your local coffee shop 100 percent of the time—some may have location considerations, such as the need to attend occasional in-person meetings or service a region. DeskPlus, meanwhile, is a cousin of Remote. If you have a DeskPlus arrangement, you are based out of a company office, but can work at a location of your choosing for some portion of your time. Utilizing location variety can enhance productivity and free you from long commutes, meetings, and office formalities for certain days. (In other words, if you want work in your pajamas, no one has to know.) A DeskPlus arrangement can either be preset—e.g. you can work outside of the office every Friday—or ad-hoc—e.g. you work from a location of your choosing a day or two each week, and not necessarily the same day(s) each week. That's a lot to remember, so we'll make it easy: Think of Remote as "location independence," and DeskPlus as "location variety." And think of them both as part of the #futureofwork! Which type of flexibility do you need? Take the FlexType quiz to find out!